Daily Illuminator: Come To An Illuminati Secret Meeting! September 6, 2018: Come To An Illuminati Secret Meeting! Hey, you. Are you reading this? Can you see this post? That means you've been selected. Most people reading today's Daily Illuminator will just see another photoshop of Steve Jackson's head on Kim Jong Un. But you are invited to attend an Illuminati Secret Meeting. On November 2, 3, and 4, all around the U.S. and Canada, key people such as yourself will gather at boardgame stores to plan their next moves in building up the conspiracy. These people will likely receive talismans representing their involvement, like those pictured in this Illuminator. Will you be the one to rule the world? If you play your cards right, you could be. Don't miss this unique opportunity. 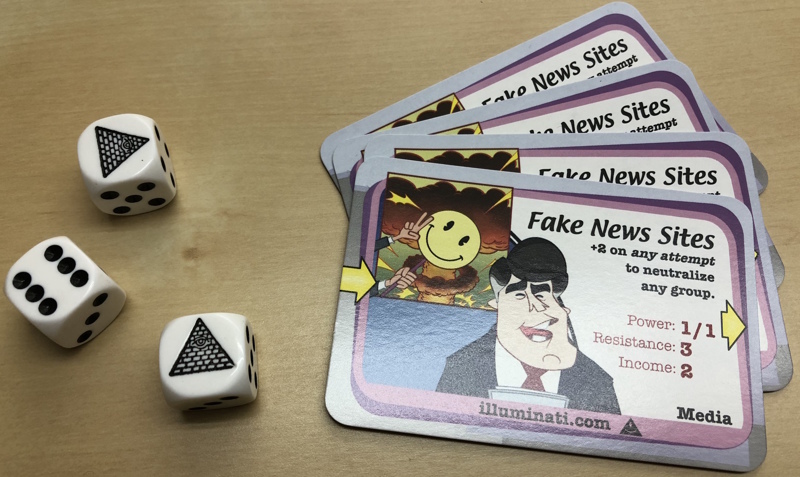 Talk to your friendly local game store about hosting an Illuminati Secret Meeting in your area (tell them to email organizedplay@sjgames.com to find out how). Join us now! We may not ask again, and time is of the essence . . .